Looking for the best women's hiking boots? Are you ready to toss out your tatty old hiking boots and spring for a brand new pair? Well, we know how you feel. But hold on, you can’t just order the first boots you spot. With our guide and review you’ll know exactly what to look for in your new set of hiking kicks. Read on to discover the best hiking boots for women in 2018. Blisters, hot spots, squished toe nails— these are all the unfortunate result of ill-fitting shoes. A good fit is the difference between you skipping happily along a trail or gritting your teeth with each step. While pursuing the top-rated hiking boots for women you must examine these features in depth-- comfort, durability, stability, weight, warmth, and water resistance. Finding the right fit for your foot is the most critical step when selecting a hiking boot. Ignore size and numbers and just choose a boot that feels right for your foot size. So even if that means ordering two sizes up or getting cartoonish shoes that look like they could fit your dad, don’t pay mind to it. Also, make sure to always try on the boots with the appropriate hiking socks that you’ll be donning on the trail. Sock details like toe seams and overall thickness can cause blisters or relieve hot spots in your boot. The boots should also have a snug fit at the heel and wiggling room for your toes in front. There must also be adequate room in the toe box, since that section of boots stretches out the least during the break in process. Podiatrists can design a special orthopedic insole that will alleviate arch problems and care for tender heels. So you can swap out the factory included footbeds out for the custom insoles, or a boot fitter can stretch out segments of the boot. But truthfully, that is a lot of extra work for a pair of shoes and you’ll save yourself time and money if you just find a boot that feels good at the get go. Here are a few symptoms that indicate you need different boots: tenderness on the heel and ball while hiking, sharp pain in the arch, and persistent heel slip. At the end of the day you can avoid most of these boot problems by properly vetting them and taking your new trekking kicks for plenty of test drives before you run a freaking marathon on the trails. Yet, even the highest-rated walking boots for women are going to hurt your feet if you wear them straight out of the box. The features you spring for must be engineered for the terrain you adventure in and the amount of weight you haul around on the trail. However despite appearances that extra weight on your feet really takes its toll in terms of energy expenditure by the end of the day. So most of the time, when you narrow down your search for the best trekking boots for women opt for the lightest boots you can get away with. 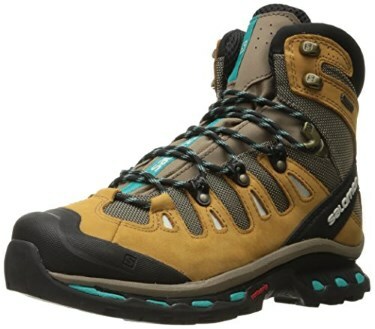 Because a pair of mountaineering trail boots would be overkill for a backpacker who does weekend trips with a light pack and only traverses well groomed trails. So when you're only carrying 15 pounds and the trail well kept, a mid cut boots (with medium sized shafts) are the optimal choice. But if you are going bushwhacking, boots with tall shafts and inch tall platforms will keep your feet safe and supported while you step on loose dirt and wobbly rocks. The comfiness of your boot depends on fit, but the best hiking boots need to have the right shape (catering to either wide or narrow feet) and ample padding. So to find your perfect fit, keep in mind these boot details. Tongue padding should be ample, yet relatively stiff to prevent that "cutting" feeling from tight laces. The stiffer the sole, the more padded the tongue should be to counteract the torque of a rigid sole. Yet, an unfortunate amount of stiff soled boots have sparse tongue padding which results in some truly nasty shin rubbing and makes ascending steep hills kinda torture. 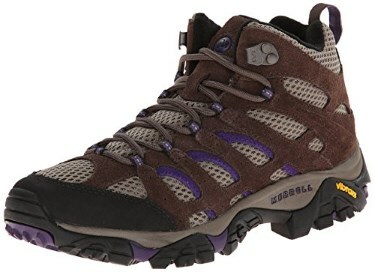 Also, internal ankle padding is a well hidden feature in the best hiking boots for women that’s truly critical to your comfort, as you probably know everyone's typically bony feet lack extra cushioning that is required for the foot's bending and rotating that happens thousands of times a day. The greatest hiking boots for women will have a snug fit around the heel and ankle to eliminate weird movement and heel slippage. Also shoot for decent padding on both sides of the joint to fend off chafing. Most trail blisters occur in the back heel region (that wrinkly spot under the ankle) due to poorly broken in boots, heel lift from overly stiff soles, or ill fitted molded heel cups. At the end of the day you can evade major missteps and discomfort by thoroughly breaking in your boots. When you are searching for the very best women's backpacking boots remember to choose boot that fits your need for the majority of your adventures whether that means you hike on seacliffs or you hike in Wisconsin (the land of perpetual winters). Yet always err on the more cushy and protective side of things. Check out this video for a demonstration on how to test the fit of your hiking boot. Here's what the lovely video host covers: make sure you can comfortably wiggle your toes, be able to push your toes to the front of the boot, crouch down to see if there is any heel lift (because that problem puts you on the fast track to blisters). Lastly, make sure it snug but reversely there is plenty of room for socks and swollen feet because yes, your feet grow and shrink everyday! Here are the very best hiking boots for women in 2018. The Vasque Women's Breeze 2.0 Gore-Tex Hiking Boot is a tough trail runner and is their most breathable hiking boot with abrasion-resistant air mesh panels. Despite its breathability this boot offers ample waterproof protection with its GORE-TEX with Extended Comfort Technology, which is especially good if you want to stay light footed even while hiking in the rain. The molded rubber toe keep those little piggies safe and un-stubbed, and the Dual Density EVA footbed banishes hot spots and blisters. Additionally, reflective piping increases the boots visibility, which comes in handy while grabbing your boots in the middle of the night for that routine midnight pee break. The shaft rises to approximately 5.5" from arch, the heel measures at 2.75”, along with a 1.25” platform meaning this boot has excellent grip, and top notch show absorption. Then the exclusive Vibram Contact outsole with XSTrek Compound adds an extra dimension of stability and tread to the bottom of the booties. The Keen Women's Voyageur Mid Hiking Boot has some outstanding ventilation that will save your feet on those boiling summer days. Its aggressive outsole has 4mm lug, which really bites into the ground and keeps you from slipping clean off the trail. Additionally, its ESS shank provides torsional stability to keep your feet bending the direction you want them to. This boot is outfitted with a 4” shaft, a 2” heel and a 1.25” platform, offering a medium amount of support for optimum versatility, and mobility in terms of terrain. Lastly this boot has waterproof leather uppers to fend off those pesky twigs and rocks that want to slip into your shoes. 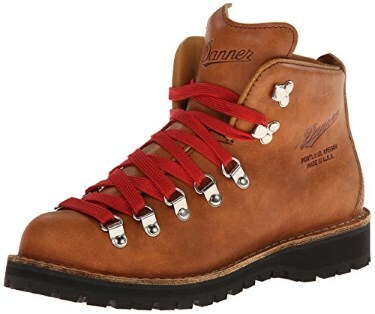 The Danner Women's Mountain Light Cascade Hiking Boots are made from scratch in the good ol’ USA. The Dri-Lex lining provides increased breathability and comfort while the Vibram Kletterlift outsole is specifically designed for comfort and durability on both wet and dry surfaces. The shaft measures at approximately 5" from arch to keep those precious ankles protected mile and after mile. Also Danner’s hand-crafted stitchdown construction increases durability and underfoot stability, so these boots will age very well over time and could potentially last you a decade. The Sienna Cache leather make these boots watertight but the Dri-lex lining greatly increases breathability to release extra heat from the shoe. 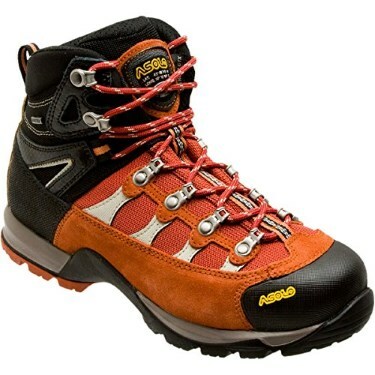 The Asolo Women's Stynger GTX Hiking boots are constructed with water resistant suede and high tenacity nylon that are extremely lightweight but also resistant to wear, tear, and weather. These hiking kicks are outfitted with a shocking absorbing anatomic footbed to keep your feet on cloud nine even though you might be marching through some hellish, rough terrain. These sporty little boots weight only 2lb 7oz (size 6.5), but pack in the sturdy features that make arduous hikes much more comfortable. Additionally, the water proof Gore-tex lining will keep foreign moisture out of your shoe, while the Asolo Syncro sole will keep you from sliding into a river. The Stynger's lacing system locks your heel in place to eliminate lift and allows precision footwork on rough terrain. Merrell Women's Moab Ventilator Mid Hiking Boot are some ultra-light breathables that work hard to keep you cool when the weather is anything but. The extremely grippy 5mm lugs make these the perfect tool for slippery trails and the tough rubber toe bumper will keep your wee toes protected when you inevitably stub your foot. A mesh padded tongue protects your instep against lace pressure without inhibiting breathability. It also features a breathable-mesh upper, leather overlays and a bellows tongue that seals out icky trail byproduct like twigs and pebbles. The Merrell shock-absorbing air cushion and compression-molded EVA foot frame adapts to your foot to keep your feet and delicate arches comfy on the trail from start to finish. Finally, the shaft measures at approximately 5" from arch, offering sturdy support for wobbly ankles. The Salomon Women's Quest 4D 2 GTX Hiking Boot is an all season pair of trekking kicks, with a smart performance comfort membrane for protection from the rain along with a watertight mud guard at the base, so mud stay on the trail, where it belongs. These shoes are extremely comfy with their OrthoLite sockliner and a molded EVA midsole it will feel like you’re walking on clouds, instead of dry packed dirt. Also, the non-marking grippy outsole will keep your boots looking newer than they are, and will also keep you from teetering over while scaling slippery surfaces. The sturdy shaft measures at approximately 6.5" from arch, the heel comes in at 1”and the platform stands at 0.75”, providing massive protection from demanding terrain, like slush, wobbly rocks, and washed out trails. 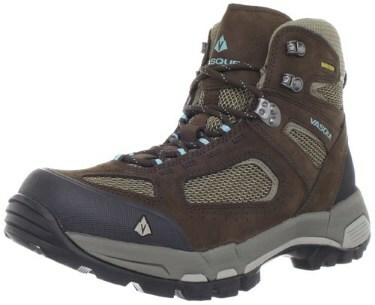 The best women’s hiking boot is… the Salomon Women's Quest 4D 2 GTX Hiking Boot! First is the water tight protective mud guard banishes waterlogging, their high shaft offers some mountaineering boot level protection for flimsy and sensitive ankles alike. 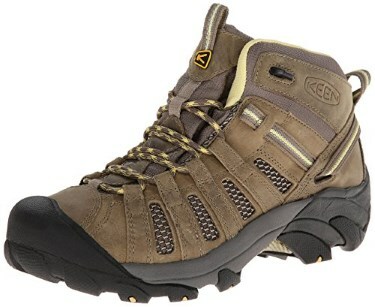 They are also outfitted with a shock absorbing platform so the trails beat up your boots, not your feet. Then finally the Ortholite sock liner and comfy molded foot sole will keep your feet feeling fresh even after climbing Half Dome. There you have it, our review showing you the best hiking boots for women in 2018!